One of the many films that premiered at this year’s Sundance Film Festival was director Colin Trevorrow‘s Safety Not Guaranteed. Written by Derek Connolly, the film’s about “a trio of magazine employees investigate a classified ad seeking a partner for time travel. One employee develops feelings for the paranoid but compelling loner and seeks to discover what he’s really up to.” It’s based on a real ad that was passed around the internet in 2005 and it stars Aubrey Plaza, Mark Duplass, Jake Johnson and Karan Soni. Shortly after premiering, FilmDistrict bought the film, so you can look forward to seeing it at some point in the future. For more on the film, you can read Matt’s review. After seeing the film, I got to sit down with Jake Johnson for an extended interview. While Johnson has been working steadily over the past few years on TV and in the movies, with the success of FOX’s hit show New Girl (he plays one of Zooey Deschanel‘s roommates), his career has definitely taken a big leap forward. During the interview we talked about making Safety Not Guaranteed and how he got cast, what’s coming up on New Girl (some of the roommates are going to start hooking up with each other), how Deschanel got him on Twitter, playing Jesus in A Very Harold & Kumar Christmas, 21 Jump Street (he plays the principal), and a lot more. Hit the jump to watch. As usual, I’ve time indexed the interview so you can watch the parts that interest you. :02 Says how he was talked into joining Twitter by his New Girl cast members, and then he became addicted to it. 2:16 Talks about what it’s like to be on a ridiculously popular show. Tells a funny story about people asking him to take a picture of Michael Cera when he came to Sundance for Paper Heart. 4:30 How’d he get involved with Safety Not Guaranteed? Says he’s known the director for a long time and they used to make YouTube shorts together. 5:49 How soon when he’s reading a script does he know that he wants the part? Says he has to finish the script first, but he knows after the first 20 pages or so whether or not he’ll respond to the material. 7:24 Briefly describes the plot of the movie. 9:06 How much did the script change from when he first got it to the finished film? Says it changed quite a bit, but it’s all on the screen. The director saw Johnson’s character as a guy who did cocaine but Johnson saw the character as a guy who’s more of a hippie, so they talked about the character and changed it up a bit. 10:22 Talks about playing Jesus in Harold & Kumar. Says he had to stay in Jesus wardrobe all day and the Detroit strippers on set were talking him up a lot. 11:24 Talks about who he plays in 21 Jump Street. He’s the principal of the school. Talks about his friendship with Jonah Hill. 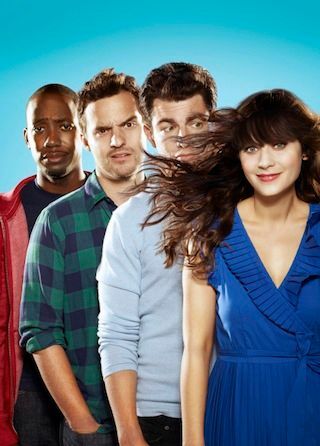 13:08 Talks about New Girl. Says they’ve shot 16 episodes so far and they’re doing 24 in total this season. Talks about Martin Starr coming on to guest star. 13:52 The daunting task of staying funny for 24 episodes in a row. Talks about the enormously talented creative people involved behind the scenes. 15:36 What season on the show does he think people will be sleeping with each other? He says there’s actually some in season one.